Defender Mn - Kenya Biologics Ltd. Apply by foliar spraying diluted with a minimum expenditure of 200L water/Ha. It can also be applied in drip irrigation and hydroponics. It is recommended to establish a dose range, and the doses to be used will depend on the severity of the deficiency and soil type. In case of persistence it is necessary to repeat the dose (see the table of dosage by crop). DEFENDER MANGANESE is stable for at least four years since manufacturing date. Store in the closed original container in a cool, well ventilated area. DO NOT store for prolonged periods in direct sunlight. Keep away from food, drink and animal feeding-stuffs. Keep out of the reach of children. Use in case of recognised need. 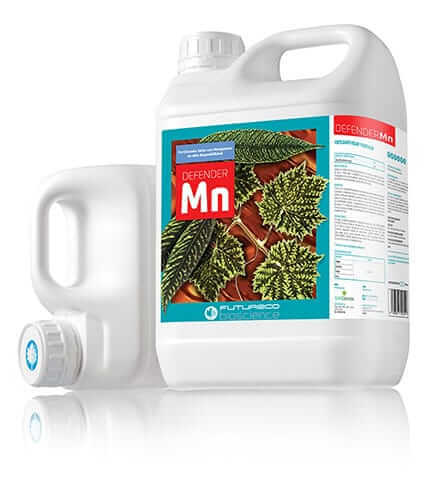 DEFENDER Mn is compatible with most pesticides, however it is recommended to test physical compatibility before mixing. Apply when there’s enough leaf mass. Apply when first symptoms appear. Apply at the moment of pre-flowering.